Other Gifts - Michelle’s Craft Basket - Gifts, Favors, Accessories and More! EVERYTHING on this page has just been price reduced, for a limited time! Get them while they're on sale, or miss out on the deal!! This adorable clipboard will make your tedious daily work so much more enjoyable! Or, if cupcakes aren't you style, let me know what is, by theme, colors, or patterns. I can create just about anything to match you and your personality! This square votive holder is decorated with cherries and cherry blossoms! Inside is a Cherry Blossom Body Spray and a red PartyLite tealight (which will burn for approximately 4-6 hours), wrapped in a mesh, drawstring bag with a matching red bow. 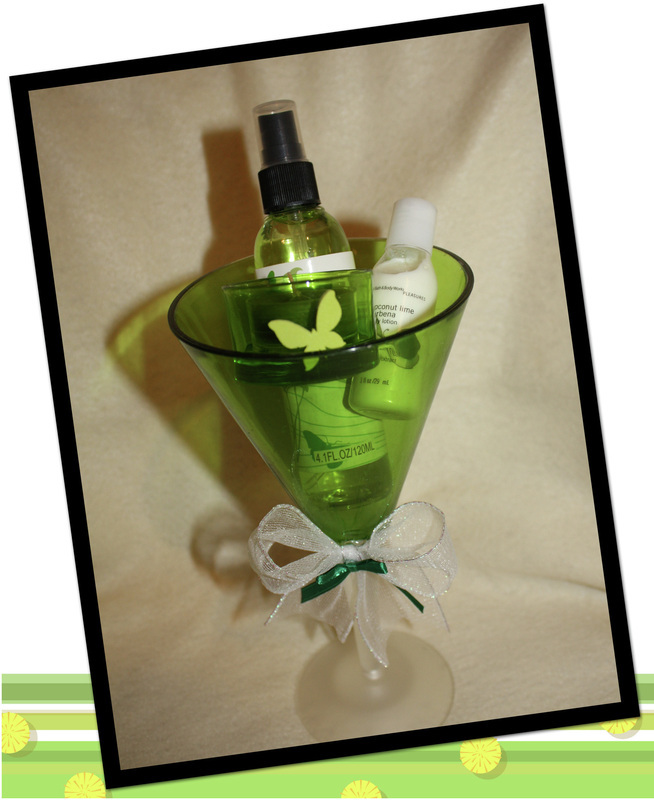 This martini glass, which is accented with a white and green bow, contains a Sugar Pear scented Body Splash, a Bath and Body Works Coconut Lime Verbena Body Lotion and a Ginger Apple Partylite Tealight (which burns for approximately 4-6 hours) in a green tealight holder with a matching green butterfly. 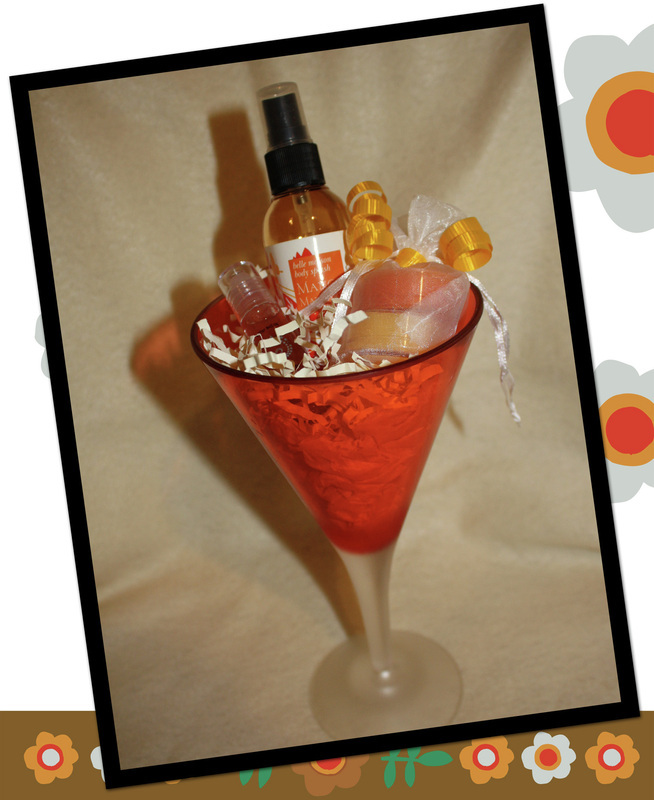 This martini glass contains a Mango Mandarin scented Body Splash, a glitter lip gloss and two Partylite Tealights (which burn for approximately 4-6 hours each) in a drawstring, mesh favor bag. 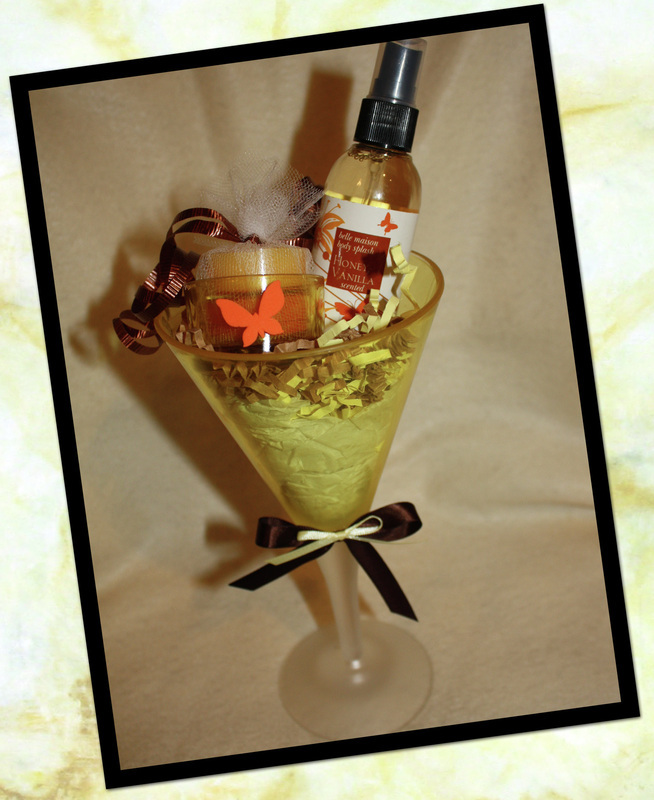 This martini glass contains a Honey Vanilla scented Body Splash, and two Partylite Tealights (which burn for approximately 4-6 hours each) wrapped in tulle and tied with a festive bow sitting in a matching yellow tealight holder with an orange butterfly on it. This sunflower mug contains a Cinnamon Sticks, PartyLite tealight (which burns for approximately 4-6 hours) and a packet of Earl Grey tea. Already tied with a curly brown ribbon, it's ready to give as a gift, or use yourself! This martini glass contains a travel-sized Coconut Lime Verbena, Bath and Body Works lotion, along with a Ginger Apple, PartyLite tealight, (which will burn for 4-6 hours). The gift is accented with a cute white bow at the base of the glass! This tall-standing votive holder is decorated with a bright green and fuscia flower on the stem. It comes with a matching green, PartyLite votive, which will give you 8-10 hours of enjoyment! This martini glass is decorated with a purple flower on the stem and comes with a matching purple, PartyLite votive, which will give you 8-10 hours of enjoyment! Burn the votive right in the glass and then pop out the metal disk and treat yourself to a after-work cocktail! This crackled glass votive holder really sparkles when the light from a candle shines through! Complete with a PartyLite tealight (which will burn for approximately 4-6 hours), and accented with a fall leaf, it adds warmth to any room! This crackled glass votive holder really sparkles when the light from a candle shines through! Complete with a PartyLite tealight (which will burn for approximately 4-6 hours), and accented with a bunch of grapes, it adds warmth to any room! Choosing the perfect gift for your child's teacher can be difficult, especially if you want to thank this person for being such an important part of your child's life. Give them something they can enjoy and use into the new year. This basket contains an adorable "old tyme" schoolhouse and a crayon box (see picture below) of 6 PartyLite votive candles (for up to 60 hours of enjoyment)! This basket also comes with a card, so you can let them know exactly how you feel! *This gift has been promoted and stamped as *teacher approved*! Choosing the perfect gift for your child's teacher can be difficult, especially if you want to thank this person for being such an important part of your child's life. Give them something they can enjoy and use into the new year. This box of "crayons" contains a sampling of 6 PartyLite votives (for up to 60 hours of enjoyment), complete with crayon wrappers, stating #1 Teacher! Choosing the perfect gift for your child's teacher can be difficult, especially if you want to thank this person for being such an important part of your child's life. Give them something they can enjoy and use into the new year. This large "crayon" is a 3" x 5" PartyLite pillar candle and comes complete with a crayon wrapper, stating #1 Teacher! This Flower Pot Trio is accented with mini silk flowers. Each pot contains a PartyLite tealight (for a total of up to 18 hours of candlelight), with an additional flower. After burning, use this item to display flowers, herbs, or more candles! This large flower pot contains 6 silk sunflowers, each with a different scented tealight center (for a total of up to 36 hours of candlelight)! This flower arrangement is perfect for offices or classrooms (where you cannot burn candles) or makes a great housewarming gift! This striped flower pot contains 5 tealight "flowers", each with a different scented tealight center (for a total of up to 30 hours of candlelight)! This flower arrangement is perfect for offices or classrooms (where you cannot burn candles) or makes a great housewarming gift!